March Edition of Grapevine,OUT NOW! 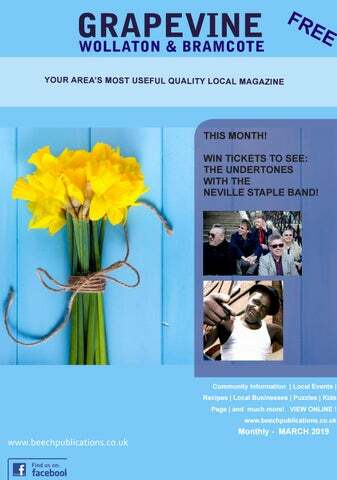 This month: Two competitions inside for two lucky readers to win tickets. One entry is to see the talented Eddi Reader at Drill Hall in Lincoln, and the second one is to see Walter Trout playing at the Engine Shed in Lincoln! GOOD LUCK. Also, some interesting Community information in this edition of Grapevine. As always please support out local businesses and trades people advertising in the Grapevine, thank you. 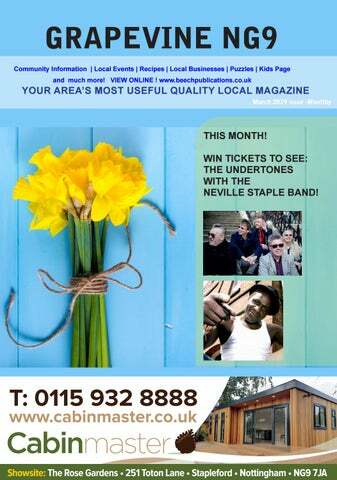 This month we have a competion for one lucky reader to win two tickets to see Howard Jones in Concert in Newark. We also have a gorgeous cheese scone recipe, I have baked these and they are delicious. Keep sending in community events and let everyone know what’s happening in the area. Hi everyone, Th is month Glorious Homes in Sandiacre are organising a one day paint course, for anyone wishing to learn how to re-vamp furniture or other items, look on page 23, a creative day out. Heritage weekend is in September, it’s a chance to visit places that is not normally open to the public and all entrance to these places are FREE, I can’t list every single event but visit the website, see pages 44,45,46, & 47.